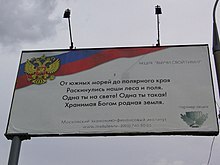 The second stanza of the anthem in on a Moscow billboard. The State Anthem of the Russian Federation (Russian: Госуда́рственный гимн Росси́йской Федера́ции, translit. Gosudárstvennyj gimn Rossíjskoj Federácii), sometimes just called the Anthem of Russia (Гимн России), is the name of the national anthem of Russia. First used in 2001, its music is the same as that of the former national anthem of the Soviet Union, which was written by Alexander Alexandrov in 1938. The words were newly written by Sergey Mikhalkov in 2000, who also wrote the words for the Soviet national anthem back in 1943. What is today the Russian Federation has had several different anthems over the years. The earliest of these, called Let the Thunder of Victory Rumble! (Гром побе́ды, раздава́йся!) was used in the late 18th to early 19th century. In 1816, the Russian Empire adopted The Prayer of the Russians (Моли́тва ру́сских), whose melody was that of the British anthem God Save the King. This anthem was used until 1833, when a new composition called God Save the Tsar! (Бо́же, Царя́ храни́!) was chosen by Nicholas I, but did not became popular until 1837. Its melody became used in classical music such as Beethoven's Wellington's Victory and Tchaikovsky's 1812 Overture. God Save the Tsar! continued to be the national anthem until the February Revolution in March 1917, when an adaptation of the French national anthem, known as the Worker's Marseillaise (Рабо́чая Марселье́за), was used for a short time. Later that year, when the October Revolution happened, the Bolsheviks adopted a Russian translation of The Internationale, which became the national anthem of the Soviet Union when it was founded in 1922. This was replaced by the State Anthem of the Soviet Union with Alexandrov's music and Mikhalkov's lyrics in 1944. The lyrics were removed in 1953 after the death of Joseph Stalin, but a new set of lyrics were added in 1977. While the republics of the Soviet Union had their own anthems during this time, the Russian SFSR did not, instead using the Soviet national anthem. However, in 1990, the Russian SFSR adopted a composition by Mikhail Glinka, known as Patrioticheskaya Pesnya (Патриоти́ческая пе́сня), as its state anthem. There were never any official words to this song. After the Soviet Union broke down in 1991, the president of the newly-formed Russian Federation, Boris Yeltsin, continued to use Patrioticheskaya Pesnya as the country's national anthem. When he was replaced by Vladimir Putin in 2000, the new president began to push for the melody of the old Soviet anthem to be brought back. Finally, in December of that year, the State Duma voted in favour of the music of the Soviet anthem, together with new lyrics by Mikhalkov, to be adopted as the national anthem, and the new anthem was performed for the first time during a ceremony at the Great Kremlin Palace just before the New Year. Your heritage for all time! Our devotion to our Fatherland gives us strength. This page was last changed on 18 September 2018, at 14:57.